If you claim to know the unique art of Indonesia, you should know Angklung. West Javanese musical instruments are still played by the students at the school. Not only that, thankfully, still there who remember this heritage by playing in the show. To know the history of musical instrument Angklung, I will discuss briefly below. Since when Angklung arise is still unknown. However, there is the oldest angklung has reached 400 years. Angklung gubrag made in Jasinga, Bogor, West Java. In Serang, type Angklung regarded as a sacred instrument that is used as a mantra to accompany the sick or refuse treatment of disease outbreaks. Angklung is known to come from West Java. However, in some areas of Indonesia are also in the traditional musical instruments. In Bali, Angklung Ngaben used during rituals. In mature, Angklung used procession as musical accompaniment. While in the South of Kalimantan Angklung used as company horse show Gepang. History records that in West Kalimantan, there are Angklung, but according to some figures of culture, Angklung is gone. 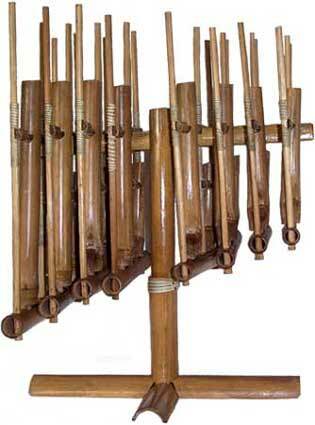 In 1938, "Daeng Soetigna" Angklung is based on sound diatonik. Aside from being a servant spells, Angklung initially used for certain ceremonies, such as rice planting ceremony. However, with the development of this instrument, Angklung used in the traditional art of entertaining performances. In the Dutch colonial period, Angklung musical instrument, which is the native spirit of nationalism. Thus, the Dutch Government banned playing Angklung, except when played by children and beggars because they do not give any effect. After experiencing rises and descents ", Daeng Soetigna" managed to increase the degree of Angklung instrument. In fact, Angklung recognized by a great musician Igor Hmel Nitsky of Australia in 1955. Angklung with sound diatonic created by make Angklung Daeng also acknowledged the Government as a means of musical education. After the death of Daeng Soetigna, Angklung more developed on the basis of the music of Sunda Salendro, Pelog and Madenda. People who develop are credited with Udjo Ngalagena. Udjo is one of the students Daeng Soetigna Angklung instrument developed in 1966. As a form of art maintain Angklung, Udjo or commonly known as Angklung Mang Udjo build manufacturing and development center. The place was named "Saung Angklung Mang Udjo". Its location in Padasuka, Cicaheum, Bandung. In this place, often held Angklung performance art. Visitors attending can participate and try to learn to play instruments.